Chesil Beach was a busy mark this weekend and for some it was a very good weekend. As predicted most catches were made up of Dogfish, Pout and Whiting. However there was a run of good sized Cod, all of them being around the 12lb mark. Steve Perry managed a couple of 4lb Codling then managed a 12lb Cod, proving once again why he is one of the top anglers in England. 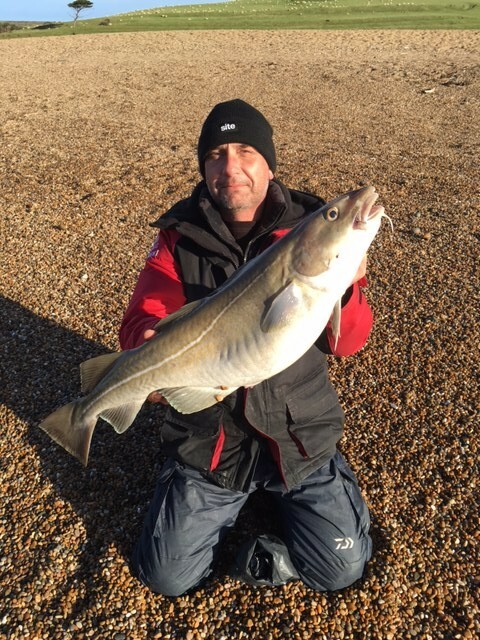 I mentioned on Friday that an angler fishing down the beach from me had managed a 12lb Cod. That angler was Mike Soanes, who kindly sent me a picture of his fish. 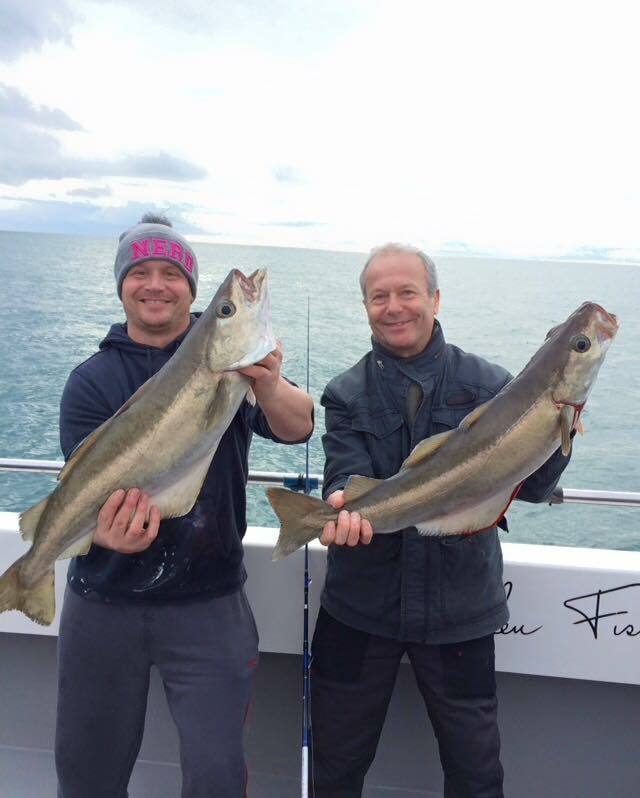 Conger fishing has been consistently good from the Abbotsbury area. 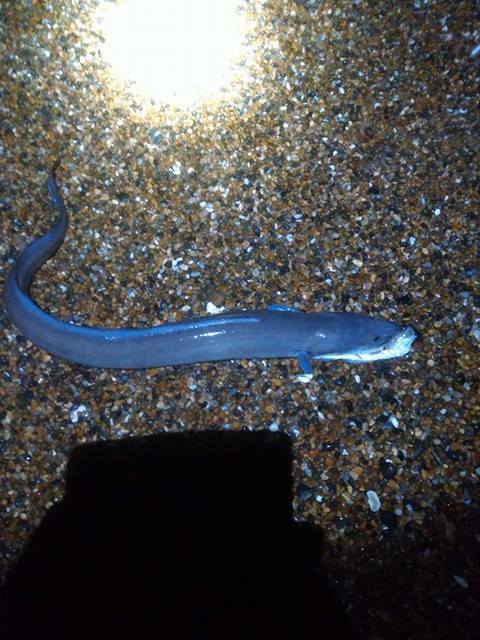 It seems that we are getting an ever increasing population of Conger’s along Chesil Beach. Robert Raybould had a reasonable one along with a Cod on Friday night. A good few of the Weymouth Charter fleet managed to get out at the weekend and they found the Pollock on the wrecks. Ryan Casey, skipper of Meerkat managed to find some nice fish for his crew. Chesil Beach forecast: It looks like Chesil should calm down over the next couple of days, as the forecast easterly wind flattens it out. This will allow long range casts that should get you out to the Whiting and the odd Cod. As long as the water is still fairly coloured there is a good chance of a Conger from Abbotsbury. My choice of mark for Cod this week would be around Ferrybridge using fresh Peeler or Hermit Crab, or Lugworm. Portland: The water didn’t clear at the weekend, but it should do over the next couple of days. When it does it will be worth trying for some Wrasse and Pollock. Portland Harbour: With the water temperature falling quickly now the crabs will be less active. This will give you a better shot at a Flounder. The other effect that the drop in temperature will have is the Bass will now move out of the harbour. Weymouth Bay: The Bass may be moving out of the harbour but there is still a chance of catching them from Preston Beach. Especially with an easterly wind creating a decent surf. Keep your baits in close. I would go for a large Squid or Lugworm bait on a long flowing trace or running ledger, fished on a light rod. 4 Responses to "Some cracking Cod"
Hello ! Well let me say that I find this site one of the best I have read. My son has moved to the Plymouth along with the grand kids. Needless to say we are looking to move down south as we like to have the kids visit and stay regularly and being in the Manchester area it’s not practical. We are aiming to buy in the Paignton / Torquay area and being a keen sea angler ( although not very successful one ) I hope to be fishing Chesil at Abbotsbury and west Bexington. I also fish the fly and have spinning gear. The articles I read on here have helped me to gain an insight as to tackle and rigs needed and I thank you very much. Who knows when we will land down there ( house to sell, house to buy ) but whenever it is I will be heading to Chesil rather quickly. I hope you enjoy lots of great fishing sessions Keith.